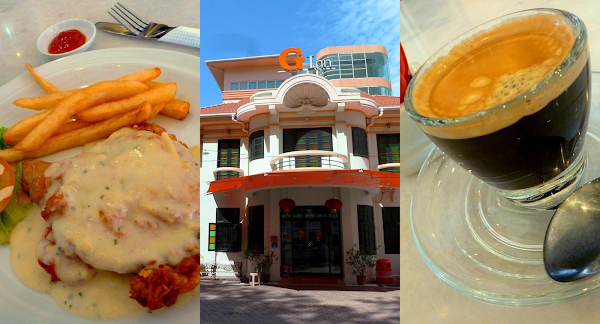 Besides the eatery near Han Chiang (韩江) school, Cafe Auwawa has a second outlet in G Inn at Macalister Road (Jalan Macalister). It is somewhat opposite of Macalister Mansion. For my lunch, my choice is Cream Sauce Chicken (RM11.90). The fried chicken cutlet is thinner than it looks. I feel that the chicken is slightly overdone. Fortunately, the cream sauce is the saving grace for the chicken. Served on the side are fries and salad. The set meal also comes with a cup of lemon tea. Resisting the spell of drowsiness, I order double shots of espresso (RM4.90) for good measure. Despite being the first customer of the day, the kitchen is quite slow in preparing food. I also feel that the dining hall is poorly ventilated. As a result, "oiliness" permeates the room in an unpleasant way. These are definitely areas for improvement.